Cometabolic biodegradation of environmental pollutants is a non-growth linked biological process catalyzed by microorganisms. During this process, microorganisms use non-specific enzymes to degrade environmental pollutants that do not support microbial growth. Since the microorganisms do not rely on the pollutants for growth, the cometabolic degradation of environmental pollutants has the potential to achieve desirable cleanup endpoints (< parts per trillion). This non-growth linked microbial degradation mechanism is significant in degrading environmental pollutants in both natural habitats and engineered bioremediation systems. Cometabolism is best defined as “the transformation of a non-growth substance in the obligate presence of a growth substrate or another transformable substance”. This definition describes co-oxidation and/or co-reduction of a substrate mediated by whole cells using existing non-specific enzymes, yet the cells are unable to obtain energy or nutrients from the transformation of the substrates to support microbial growth. The cometabolic degradation phenomenon was first reported in 1958, observing that methane-utilizing bacterium Pseudomonas methanica (renamed as Methylomonas methanica) could oxidize ethane and propane, but was unable to use these compounds as a carbon and energy source. Methane is a growth substrate for the methane-oxidizing bacterium, while ethane and propane are co-metabolic substrates. Subsequent studies have found that methanotrophs can cometabolically transform polycyclic aromatic hydrocarbons (PAHs), explosives, dioxane, polychlorinated biphenyls (PCBs), pesticides, and methyl tertiary-butyl ether (MTBE). In addition to methane-oxidizing bacteria, many other microorganisms, particularly oxygenase-expressing cultures, could cometabolically degrade persistent man-made compounds like chlorinated pesticides, halogenated aliphatic, and aromatic compounds. Figure 1. Generic oxygenase enzyme reactions with NAD(P)H serving as reductant. 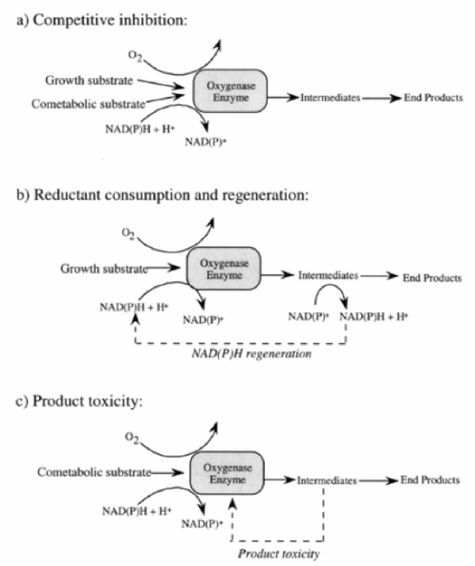 Schamatics illustrate: (a) competitive inhibition between growth and cometabolic substrates, (b) reductant consumption and regeneration during growth substrate metabolism, and (c) product toxicity exerted by transient intermediates of cometabolic substrate oxidation (reproduced with permission from ©2001 Springer). Numerous oxygenase enzymes, including but not limited to methane-, ammonia-, propane-, butane-, alkane-, and toluene-oxygenases, are known for their ability to degrade xenobiotic compounds cometabolically. Among oxygenases reported, methane monooxygenase (MMO) expressed by methane-oxidizing bacteria (i.e., methanotrophs) is one of the well-studied oxygenses. Methanotrophs can express two types of MMOs, particulate (pMMO) and soluble (sMMO). Compared to pMMO, sMMO has a broader substrate range and is known for its ability to degrade various environmental contaminants with some of the most persistent organics like pesticides, halogenated aliphatic and aromatic compounds. During cometabolic degradation of trichloroethylene (TCE; a chlorinated solvent), methanotrophs use MMO to oxidize both methane (growth substrate) and TCE (co-metabolic substrate) with an expense of a reducing energy, reduced nicotinamide adenine dinucleotide (NADH), and oxygen. During methane oxidation, MMO will first convert methane to methanol, which is further oxidized to formaldehyde, formate and then carbon dioxide, resulting in a net production of reducing energy (NADH) and metabolites (formaldehyde and/or CO2) available for microbial cell growth. As MMO is responsible for both methane and TCE oxidation, competitive inhibition of TCE degradation has been observed in the presence of methane (Fig. 1a). Different from methane oxidation, TCE is oxidized to TCE epoxide, which is quickly hydrolyzed to chlorine and carbon dioxide, resulting a net loss of reducing energy (Fig. 1b). Another unfavorable consequence is product toxicity- metabolites like TCE epoxide cause damage to cells and the degradative enzymes – limiting the amount of TCE can be biotransformed per cell (Fig. 1c). As such, if the cells contain a higher content of internal reducing energy power like polyhydroxybutyrate (PHB), a maximum transformation capacity of TCE per cell will be achieved. In general, the kinetic and extent of cometabolic degradation varied depending on the types of cometabolic substrates, species involved in the degradation, the nature of the product toxicity, as well as the availability of the internal reducing energy pool of the degradative species. There are several kinetic models available describing cometabolism, from the prospect of competitive inhibition between growth substrate (primary substrate) and cometabolic substrate, consideration of cell growth versus product toxicity, and reducing energy consumption during cometabolic degradation. Aerobic and anaerobic cometabolic bioremediation have been applied under different environmental conditions to remove contaminants including chlorinated solvents, MTBE, TNT, BTEX, and atrazine. Methanotrophic-based, large-scale bioremediation for chlorinated solvents (like TCE) has successfully demonstrated. 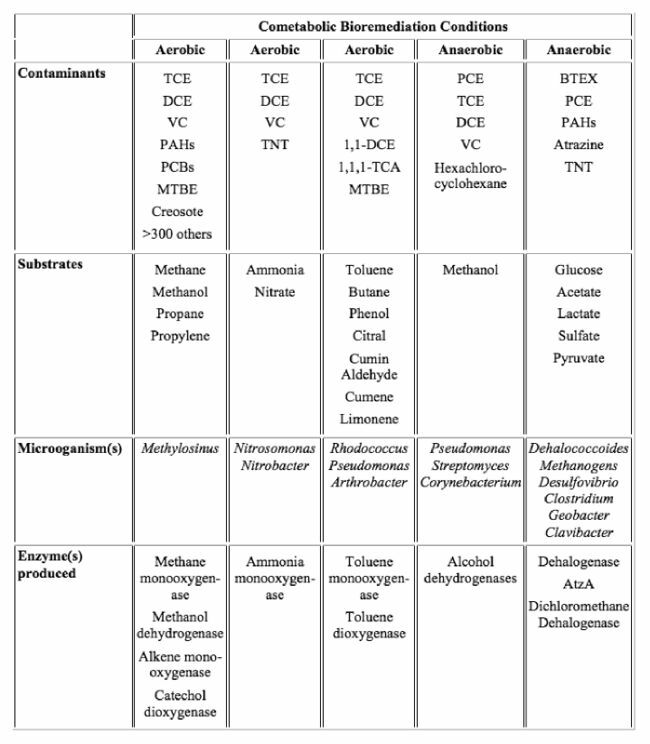 There are several common classes of environmental pollutants that can undergo cometabolic degradation by various bacteria under aerobic and anaerobic conditions (Table 1). New studies also reported cometabolic degradation of emerging contaminants including MTBE, 1,2,3-trichlopropane (TCP), 1,4-dioxane, N-nitroso-dimethylamine (NDMA), and poly-fluoroalkyl substances like fluorotelomer alcohols, and some of this knowledge has been applied to remediation in the field in recent years. Table 1. Cometabolic degradation of example pollutants under various conditions (modified from Hazen (2010)). 1,2,3-trichlopropane (TCP). TCP is a chlorinated hydrocarbon with high chemical stability. It is commonly detected in groundwater and soil, due to improper disposal. TCP is also a by-product or an intermediate in the production of various chemicals. EPA has classified TCP as a suspected carcinogen to humans. An early study has showed that methane-oxidizing bacteria can degrade TCP cometabolically. A recent study also reported that some propane-oxidizing bacteria can cometabilize TCP effectively (Chu Report). 1,4-Dioxane. 1,4-Dioxane is a likely human carcinogen and has been detected in groundwater at many sites. It is used as a solvent stabilizer in the manufacture and processing of paper, cotton, textile products, auto coolants, cosmetics, and shampoo. 1,4-dioxane can be degraded via both growth-linked and cometabolic reactions. Many oxygenase-expressing bacteria are able to degrade 1,4-dioxane to different degree under different physiological conditions. Poly- and per-fluoroalkyl substances (PFAS). Perfluoroalkyl compounds, particularly PFOA and PFOS, are not biodegradable under both aerobic and anaerobic conditions. However, poly-fluoroalkyl substances, like fluorotelomer alcohols (FTOHs) used as starting materials for many fluorotelomer-based products, are biodegradable and considered as precursors to perfluoroalkyl acids. A number of studies have demonstrated that FTOHs, including 8:2, 6:2 and 4:2 FTOHs, and FTOH-based surfactants like polyfluorinated alkyl phosphate esters and fluorotelomer sulfonates are comtabolically biotransformed into various shorter chain PFASs in soils, activated sludge, and by pure cultures. The role of cometabolism in nature is significant for the natural attenuation of environmental pollutants. For example, there are successful applications of cometabolic bioremediation for different environmental pollutants]. One major advantage of using cometabolic-based bioremediation is to enable degradation of pollutants at low concentrations and potentially achieve environmental cleanup goals. The knowledge of cometabolic degradation for emerging contaminants continues to grow and accumulate, and the anticipated cleanup endpoints for the emerging contaminants are very low (in the range of ng/L). Accordingly, cometabolic degradation process for emerging contaminants, either through natural attenuation or during active engineered bioremediation, can be a promising strategy to manage the associated risks. ^ Kim, M.H., Wang, N. and Chu, K.H., 2014. 6: 2 Fluorotelomer alcohol (6: 2 FTOH) biodegradation by multiple microbial species under different physiological conditions. Applied Microbiology and Biotechnology, 98(4), 1831-1840. ^ Chu, K. H., 2012. Biodegradation of 1,2,3-Trichloropropane, Texas Hazardous Waste Research Center Report, Project Report Number 060TAM2993. This page was last edited on 6 December 2018, at 19:13.